The two sensory gardens at Heathlands Village are key features in offering truly ‘dementia-friendly’ care. Both gardens have been designed to offer you safe, independent and easy access to the outdoors. We know how much being outside can benefit your mood and wellbeing. 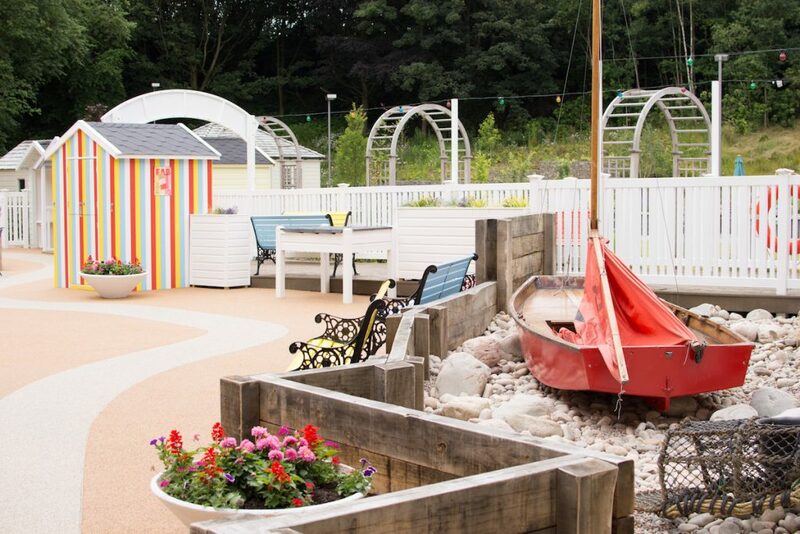 Our Seaside Sensory Garden adjoins our residential dementia care household – ‘Beach House’. This wonderful, colourful garden will transport you back to childhood holidays at the seaside. Sitting on the pier, you can admire the beach huts, ice cream kiosk and sailing boats. You can enjoy the sounds of children playing, waves breaking and seagulls crying, via cleverly hidden speakers. Our Woodland Garden adjoins our residential nursing care household – Oakwood – which is based in our annexe building at Eventhall House. This lovely, tranquil garden is accessed from the lounge area, via a decked patio which overlooks a children’s play area. The garden is surrounded by a small wood and has raised planting beds. A pretty summer-house and bird-hide make it accessible for you to use, even in the winter months. We have plans to create a third sensory garden adjoining Eventhall House, which is due to open during Spring 2019.